Tis that time of year again, boys and girls. 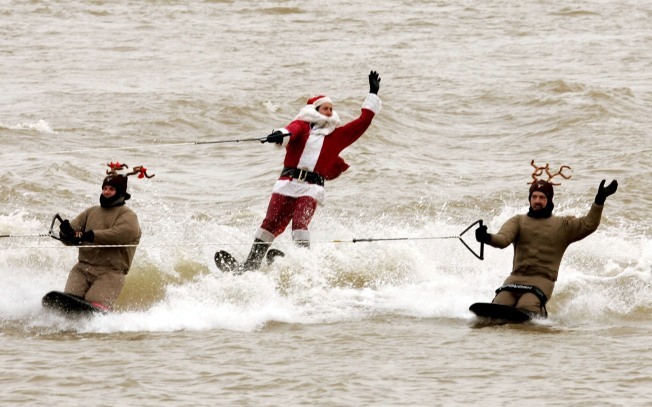 The time of year that a brave Santa suits up and waterskis with the Grinch and other seasonal faves, in freezing-cold water for our own amusement. Check out the spectacle for yourself at the National Harbor Marina this Friday, Dec. 24 at 1 p.m. Santa will hit the (teeny, wind-whipped) waves in rain, snow or shine. Other than Santa and that weasly Grinch, you can see the Flying Elves, the Kneeboarding Reindeer and Frosty the Snowman... who will be riding in a dinghy (since he can't get wet, obviously).